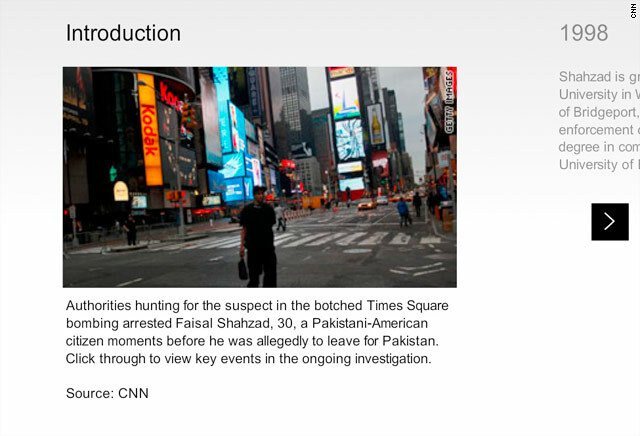 (CNN) -- A suspect charged in the failed Times Square car bombing is a Pakistani who became a naturalized U.S. citizen in April 2009 and used to work as a financial analyst in Connecticut. Faisal Shahzad, 30, most recently of Bridgeport, Connecticut, was arrested Monday night at John F. Kennedy International Airport in New York as his flight to Dubai was about to take off, law enforcement officials said. Federal authorities had put him on a no-fly list earlier in the day, with investigators having determined that he had purchased the vehicle used in Saturday's failed bombing attempt, FBI Deputy Director John Pistole said Tuesday. Customs and Border Protection agents reacted quickly to the name match and made the arrest, Pistole said. Shahzad has been charged with five counts in connection with the case, according to documents filed Tuesday in U.S. District Court in New York. According to the documents, he admitted to law enforcement officials that he attempted to detonate the bomb and that he recently received bomb-making training in the Waziristan region of Pakistan. 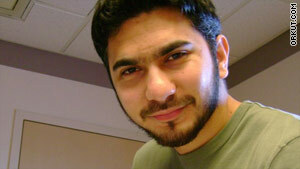 Also according to the complaint, Shahzad returned to the United States via a one-way ticket from Pakistan on February 3. He had told immigration officials upon his return that he had been visiting his parents in Pakistan for the previous five months, the complaint said. Shahzad has a Karachi identification card, a sign of Pakistani residency, and his family is from northwestern Pakistan, according to Pakistani Interior Minister Rehman Malik. Before what the court document says was Shahzad's trip to Pakistan, he lived in Shelton, Connecticut. A woman who said she had lived next door to him in Shelton told CNN on Tuesday that the man she knew didn't say much and claimed to work on Wall Street in New York. "He was quiet. He would wear all black and jog at night. He said he didn't like the sunlight," Brenda Thurman said. She said Shahzad, his wife and two children and his wife's two sisters lived next to her for about three years, moving out in July 2009. People whom she believes were plainclothes law enforcement officers appeared to be staking out the house Monday, Thurman told CNN affiliate WTNH-TV. The neighbor said she often saw Shahzad leaving the home in the morning and returning in the evening. She also saw him in his yard with his children, a boy and a girl, and the family usually wore traditional Muslim attire, she told WTNH-TV. She said she never suspected he might be involved in a possible terror attack. "I didn't think he was capable of doing something like that. ... I'm very shocked," she said. Shahzad's wife spoke English, but was apparently so insecure about her language ability that she told people she did not, Thurman said. Shahzad's wife told Thurman in July 2009 that the family was moving to Missouri. A few weeks after they left their home, the lender foreclosed on the property and changed the locks, the neighbor said. At the Bridgeport residence where authorities say he lived most recently, agents with the FBI and local police, including members of a bomb squad, conducted a search, and investigators removed filled plastic bags. Cell phone calls conducted for the purchase of the vehicle used in Saturday's bombing attempt helped lead police to the suspect, law enforcement sources said. Sources said investigators got cell phone information from the daughter of the Nissan Pathfinder owner. She sold the vehicle to Shahzad on behalf of her father. She had been talking on the phone to Shahzad in arranging the purchase of the SUV, which was advertised for sale on Craigslist. The Nissan Pathfinder was parked in Times Square containing propane tanks, fertilizer and gasoline on Saturday night. After police retrieved the vehicle identification number of the Pathfinder, they located the registered owner of the vehicle. The sources said the owner's daughter had met with Shahzad at a Stratford, Connecticut, grocery store, for the sale. Shahzad took the car for a test drive in the parking lot and bought the vehicle for $1,300 in cash. Bridgeport is a working class city of 130,000 on Long Island Sound, 66 miles northeast of New York City. Per capita income there is 26 percent below the national average, and 27 percent of its residents are foreign-born, more than twice the national average, according to the U.S. Census Bureau. CNN's Deborah Feyerick, Drew Griffin, Joneil Adriano, Samson Desta, Reza Sayah, Jim Kavanagh and the CNN Wire Staff contributed to this report.